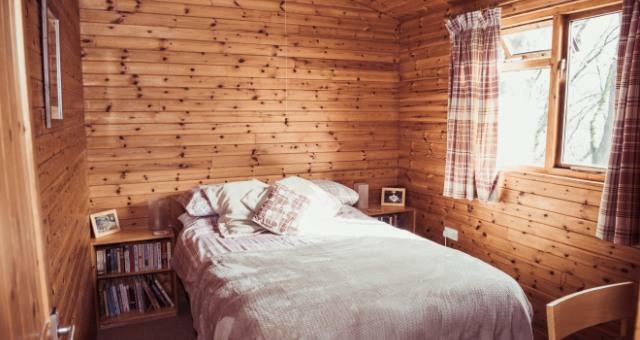 Porthouse Wood Cabins01686 625430work Self-cateringTwo log cabins situated in 9 acre South facing woodland overlooking the River Severn, 1.5 miles from Newtown, Powys. Private fishing on River Severn included. The cabins are well furnished for comfort and convenience. Each cosy cabin has a colour television, DVD player, electric heating, electric cooker, microwave oven, refrigerator, and the kitchen has all necessary utensils. Each cabin has two bedrooms sleeping 4 people. Bed linen and tea towels are provided but we ask you to bring your own towels. A cot is available if required. The log cabins are ideal for walking, fishing and cycling in Mid-Wales, in a peaceful location on the Severn Way, and cycle path along the Montgomeryshire Canal. Nearby attractions include Powis Castle (NT), Lake Vyrnwy (RSPB), Ynys Hir (RSPB) and local Montgomery Wildlife Trust reserves. Two log cabins situated in 9 acre South facing woodland overlooking the River Severn, 1.5 miles from Newtown, Powys. Private fishing on River Severn included. The cabins are well furnished for comfort and convenience. Each cosy cabin has a colour television, DVD player, electric heating, electric cooker, microwave oven, refrigerator, and the kitchen has all necessary utensils. Each cabin has two bedrooms sleeping 4 people. Pets welcome by arrangement, free of charge. Short breaks are also available - do contact us to check on dates. Take B4568 out of Newtown, signposted to Bettws and Tregynon. Approx 1 mile turn right past Llanllwchaiarn Church. Follow road to left for 500 metres, turn left up track into woodland through gate. Cabins are first turn to left. Note that vehicle access to the cabins is via a steep unmade track.